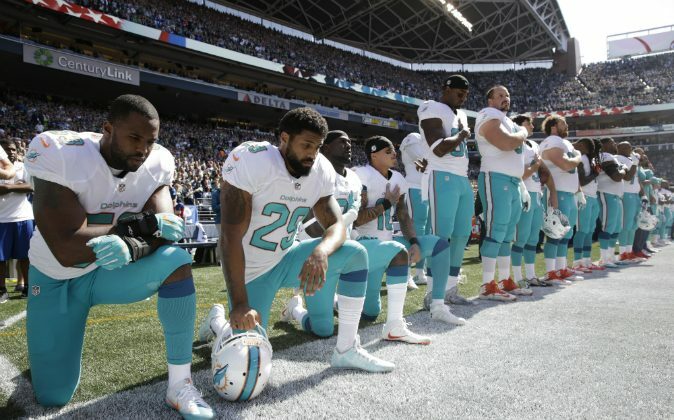 The Seattle Seahawks and Miami Dolphins weren’t only on opposing sidelines during their game on Sunday—but also in their respective styles of protest. Dolphins running back Arian Foster and his three of his teammates—wide receiver Kenny Stills, safety Michael Thomas, and linebacker Jelani Jenkins—took a page out of San Francisco 49ers quarterback Colin Kaepernick’s book and knelt during the playing of the national anthem. The rest of the Dolphins roster stood. However, the Seattle Seahawks took a different approach by standing and interlocking their arms together during the pregame demonstration. Some social media users—including model Kate Upton—lambasted Dolphins players for their timing to not stand during the “Star Spangled Banner,” since Sunday marked the 15-year anniversary of the Sept. 11, 2001, terrorist attacks. For Foster, there is no such thing as perfect timing and he believed his actions were fitting given the climate of the United States. “They say it’s not the time to do this. When is the time? It’s never the time in somebody else’s eye, because they’ll always feel like it’s good enough,” Foster said following the 12-10 road loss to the Seahawks at CenturyLink Field. “And some people don’t. That’s the beautiful thing about this country. If somebody feels it’s not good enough, they have that right. That’s all we’re doing, exercising that right,” he added. According to Foster, those who are in opposition to his and Kaepernick’s stance are angry over the message and not the act of protest itself. The Seahawks’s choice to stand and link arms was a “demonstration of unity,” said wide receiver Doug Baldwin. Kaepernick’s political stance has led to a boost in his jersey’s sales, becoming the top selling jersey in the league.